You could easily spend an entire day in Griffith Park doing nothing but taking train rides and visiting the railroad museum. In fact, Griffith Park has more train rides than any other kind of recreation. Here's a roundup of all the trains you can ride, see, climb on and enjoy. Fans of miniature trains like it but for Walt Disney fans, it's a don't-miss stop. That's because the Carolwood Pacific Railroad Company preserves Disney's barn workshop, his original engines, and railroad cars. It's next to the Los Angeles Live Steamers club, run by hobbyists who operate 1/8th-scale trains on a 1.5-mile track. Check out the Los Angeles Live Steamers website for more information. You can't ride Walt's trains, but you can take a ride on one of the other miniature trains, which are cute and fun. Imagine Ricky Schroeder and his dad rolling into their living room riding a train on the television show "Silver Spoons" — or that classic photo of Walt Disney riding his private miniature train in his back yard. The Live Steamers also run a fun Halloween Ghost Train in October. The railroad is run by volunteers, open to the public on a limited schedule, and does not charge admission. There is a small fee for the train ride. You can read reviews of Live Steamers at Yelp. 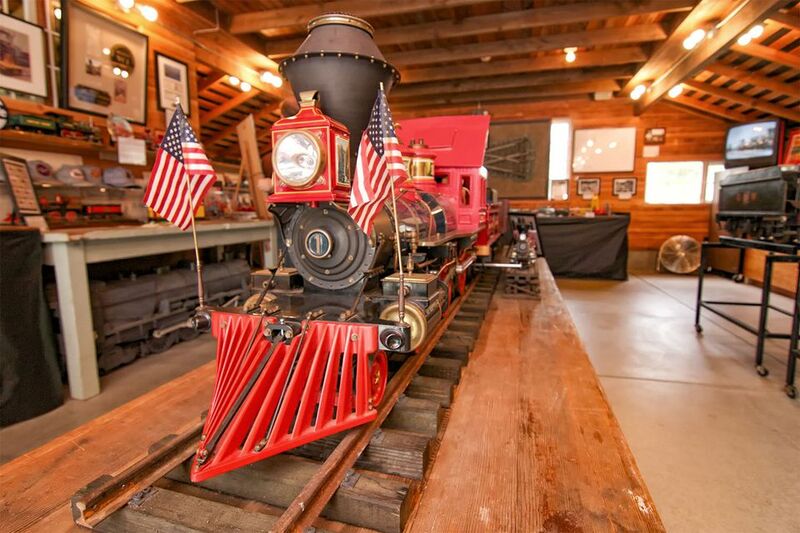 Learn more about Carolwood Pacific Railroad Company here. The railroad is located at 5202 Zoo Drive. Next door to the Los Angeles Live Steamers you'll find the Travel Town Museum and Travel Town Railroad. Travel Town's 16-inch gauge miniature railroad is slightly smaller than the 18.5-inch gauge over at Griffith Park & Southern. Travel Town's railroad history began in the 1950s when the city ran a narrow-gauge railroad along the Los Angeles River and Zoo Drive. In 1975, the city of LA commissioned the Travel Town Railroad to run a miniature train around the perimeter of the museum. Walt Disney wasn't the only train-loving celebrity of the twentieth century. The entire train at Travel Town came from singing cowboy Gene Autry’s Melody Ranch. The original locomotive was replaced with a non-steam version, but the cars are original. Travel Town Museum is also worth a stop if you love railroads. It has a collection of significant locomotives and rolling stock from Southern California. For railroad buffs, docents give guided tours of selected railroad cars the second Saturday of every month. Check the guided tour schedule. The Travel Town Museum gets extraordinarily high ratings from visitors, who love the fact that they have real trains you can climb onto. Kids seem to like it, and lots of people say it's a good place for a birthday party. Travel Town is the highest-rated railroad experience in Griffith Park. To get a better idea of what it's like, read some of the Travel Town Reviews at Yelp. Travel Town is open every day of the year except December 25 and does not charge an admission fee, although you do have to pay for the train ride. It is at 5200 Zoo Drive, next to the Live Steamers. Find out more at the Travel Town website. As if all those trains aren't enough, there's more. Miniature trains have operated at the Griffith Park and Southern's location since the 1940s, but the Griffith Park and Southern Railroad started in the 1960s. It has a mile of track, and everything is about one-third the size of standard trains. The cars are reproductions of classic American trains from the early twentieth century. People like the Griffith Park and Southern. They especially praise the holiday train ride and talk about how much fun small children have there. To see what others have to say, you can read some of their reviews at Yelp. The Griffith Park and Southern Railroad is open every day of the year, except for Christmas Day, Their trains run on a mile of track, across a bridge, through a forest and an Old Western Town and the ride takes about 10 minutes. They charge a fare that's as scaled-down as their trains are. It's at 4400 Crystal Springs Drive. The Griffith Park and Southern Railroad runs a Holiday Light Festival Train ride for the Christmas season. It runs from just after Thanksgiving through the end of the year. You can get their hours and more details at the Griffith Park and Southern Railroad website.